Everyone gets the blues at one time or another, but what happens when a four year old gets them? How on earth can a loving parent explain just what the blues are and how to deal with them? 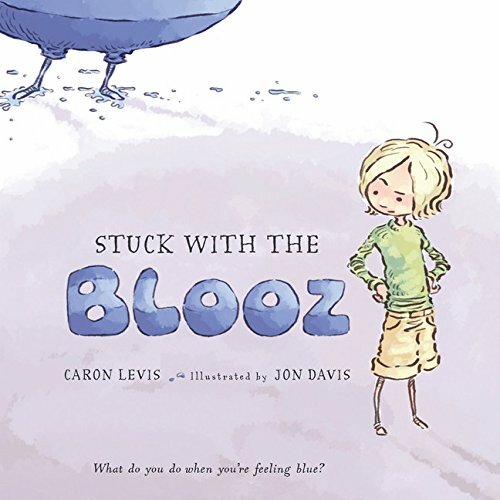 The answer to this universal question may lie in the blue-tinged pages of author Caron Levis’ first picture book for four to eight year olds, Stuck with the Blooz. In this cleverly conceived picture book, an unassuming little girl wakes on a Sunday morning to “a damp breeze,” “squishy steps,” and “a sloshy knock at the door.” No one has to tell her twice: She knows the Blooz has come to ooze its big blue self into her usually sunny world. Nothing she does—including shutting the windows, barricading the doors, and shaking her fists at it—can keep it out. It does all sorts of mischievous things, too, like mixing her pretty paints into muddy colors, taking the good taste right out of her glass of lemonade, and refusing to tell why it insisted on coming for a visit when it knows it’s not wanted. She eventually stops trying to chase the Blooz away, and instead asks what is making it feel so blue in the first place. Not surprisingly, seeking such answers makes her feel better, because her questions are really about herself and the things that make her sad: feeling forgotten, missing mommy, and breaking her favorite crayon. Before she knows it, things aren’t so bad—or blue—after all. This is a smart book that is also a powerful teaching tool. Using these simple pages, parents can help young children identify that infamous, mostly unexplainable “blah” feeling humans of all races know as “the blues.” Parents can discuss the big, blue, out-of-shape blob (as illustrated by artist Jon Davis) called the Blooz that follows the girl around, looms over her, and makes her look very small and alone. They can discuss the different methods she uses to find a bit of sunshine in an otherwise blue day, and they can even make a learning game out of charting the steady progression of facial expressions in the book, from the sad and alone looks in the beginning pages, to the eventual expression of joy and fun at the end. Of course, there is a remote chance that very young children may experience fear seeing “the blues” personified, and may believe that something just as big and equally as blue will show up at their own door one day. That aside, this book should do well across multiple landscapes, including school libraries, preschool and early elementary classrooms, doctor’s offices, hospitals for children with long-term illnesses, and even—or especially—a quiet place in front of the family fireplace on a blustery day when the rain has washed away all chances for outdoor play.